The field of heritage language studies is under-researched and bilingual families struggle to maintain their heritage languages at home. The in-depth study reported in this chapter examined an episode of one child, a 4-year-old girl, and her parents, baking at home in order to explore how parents’ participation aligns with children’s actions in supporting their heritage language development in a home activity setting. 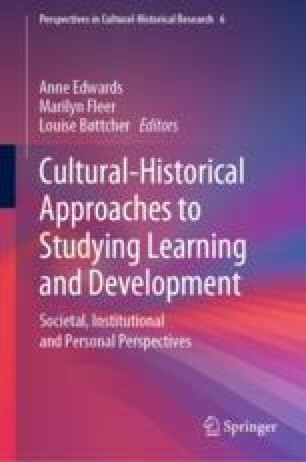 Hedegaard’s (Studying children: A cultural-historical approach. Open University Press, Maidenhead, pp. 30–45, 2008, Mind, Culture and Activity 16:64–82, 2009) wholeness approach and model of children’s learning and development through participation in institutional practices form the foundation of the analysis. Through taking different perspectives, this chapter explains how the parents interact with their daughter differently while they both aim to support her bilingual heritage learning and development and how this impacts on their daughters’ opportunities to practice Chinese in the home activity setting. This study gives insights into the essence of the activity setting as an analytical concept to research the child’s development. I would like to show my gratitude to Professor Marilyn Fleer, who provided invaluable support as supervisor of my doctoral research from which this chapter was developed. I would like to thank all the editors for their comments and contribution to this chapter. I also acknowledge my three researched families’ participation and thank them for welcoming me to video-observe their everyday activities. Feedback on earlier versions of the chapter by colleagues (Dr. Avis Ridgway and Dr. Feiyan Chan) was very much appreciated. Lin, Y. W. & Tsai, M. L. (2006) Culture and the Kindergarten Curriculum in Taiwan. Early Child Development and Care, 123(1), 157–165, https://doi.org/10.1080/0300443961230111.